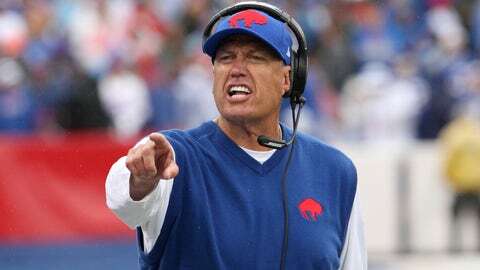 After committing 17 penalties on Sunday, Rex Ryan instituted a new rule in practice. The Buffalo Bills lead the NFL in penalties and are on pace to shatter the single-season NFL record in that category. Surprisingly, it didn’t seem to bother Rex Ryan after his team was flagged 17 times on Sunday. Ryan raised more than a few eyebrows for not being more upset with his team’s performance, but he’s seemingly cracked down in practice. According to Mike Rodak of ESPN, Percy Harvin said Bills coaches made players do push-ups if they committed a penalty. It’s not the harshest rule, but the push-up-for-penalties is a tactic former Jets coach Ryan has employed before — and it’s a start for the most-penalized team in the league. The Bills have been flagged 47 times this season and are on pace to blow by the current NFL record of 158 in a season by the Chiefs in 1998. Right now, the Bills are projected to commit 188 penalties, which isn’t what a coach wants to see from his team.